Local, Organic & Fair Trade Groceries - Delivered to Quesnel. Long Table Grocery is a locally-owned independent food hub that provides good food, that is sustainably sourced and locally-rooted in the Cariboo region of BC. As well as bi-weekly subscription Harvest Boxes we operate a fresh food grocery and no-waste cafe. We also host cooking workshops and community based food events throughout the year. 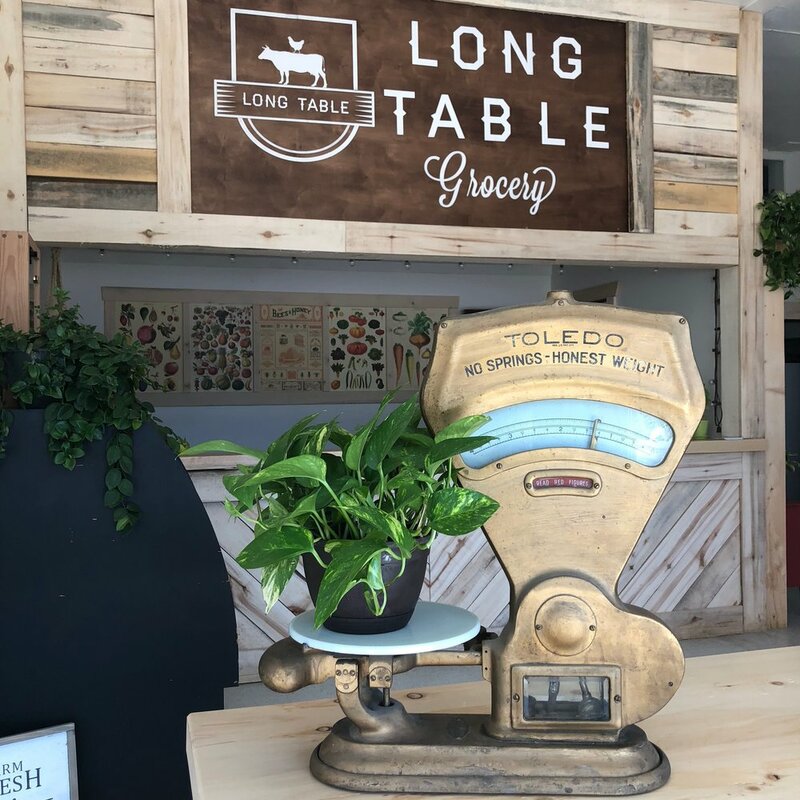 It is our goal that shopping at Long Table Local is easy, convenient, and a meaningful way to make your purchasing dollars count towards building a more food-secure community for all of us. We currently work with over 40 North Cariboo farmers and food producers, growing community through food. We purchase local produce and food products when available, and purchase organic produce from the BC and the Pacific Coast during our local off-season. We focus on local organic growers, but also support several more conventional local farms whose practices we know and trust. We also work with several local charities to improve access to fresh food for local families through our Pay-it-Forward grocery donation program in partnership with our incredible customers. We acknowledge that we live, work, and play on the traditional, ancestral, and unceded territories of the Lhtako Dené Nation. Long Table Grocery seeks to work in solidarity with Indigenous growers and makers, while respectfully acknowledging them as the traditional custodians of these lands. We are proud to partner with many local food producers and businesses through this venture. We believe in the power of collaboration to build strong community and are continually working to ensure that working with us is a fair and beneficial arrangement for local food producers, businesses, animals and the earth. We currently work with over 40 local farmers and food producers and welcome inquiries from new potential partners. Long Table offers a range of essential grocery items and prioritizes locally-grown, organic and fair trade products. In partnership with local food businesses, we are proud to offer bi-weekly grocery deliveries of a wide range of products to locations within the Quesnel area as well as a fresh food market and no-waste cafe on Tuesdays, Wednesdays and Thursdays between 12-6. Our Harvest Boxes are a convenient way to access fresh, mostly organic and local (in-season of course) produce. By subscribing to a box you are helping grow the local food system as it enables us to commit to purchasing more local crops. Farmers benefit immensely from knowing ahead of time what the demand will be for their products, and you benefit from receiving a consistent and diverse supply of local produce when in season. When we are unable to source local produce the Harvest Boxes contain ethically sourced organic produce from the Pacific Coast. Boxes are available year round, come in a range of sizes and you can change, pause or cancel your subscription at any time. Click here to learn more. We also offer weekly Salad Boxes, delivered Mondays, that are full of prepped and washed salad fixings with house made dressings. Delivery is free! Click here to find out more or to sign up. Our shop is open on Tuesdays, Wednesdays and Thursdays from 12 - 6 and is open to the public to drop in and shop. On offer each week is a selection of the freshest seasonal produce, as well as local meats, farm eggs, local bread and baking, prepared foods, preserves and pickles, locally-roasted coffee, BC teas, and select other interesting BC food products and kitchen items. We offer debit tap, credit or cash for payment options. Our shop is located at 141 Marsh Drive, across from Bumper to Bumper in West Quesnel. Click here for directions. We operate a small no-waste cafe with the surplus produce from our grocery store in an effort to reduce food waste. Our menu changes daily, but always offers soups, salads, and our popular “Elevenses” Charcuterie Snack Boxes as well as French Press coffee, tea and on tap craft kombucha. Cafe hours are 12 - 6 Tuesday, Wednesday and Thursday at 141 Marsh Drive. We offer a local food based catering menu for meetings and small events that includes Charcuterie Trays, Veggie + Fruit Trays as well as baked goods, sandwiches, salads or soup. We also create custom artisan food gift boxes of all kinds for all occasions. Click here for more information. We offer regular workshops in all kinds of DIY skills with a strong focus on cooking, preserving and gardening with a bit of art and home DIY skills in the mix. Click here to view our current course offerings or to register. Please stay in touch - we would love to stay connected! We (of course) will never share your information with anyone. "When you have more than you need, you build a longer table, not a higher fence"